Another epic blindside leaves everyone shocked. When the tribe marched into Tribal Council, Jason and Scot appeared confident that their plan of outing Aubry would come to fruition. They also seemed sure that even if one of their names were called for elimination, they could play this season's special Super Idol and remain in the game. Little did they know, though, that Aubry had been planting seeds with Tai to cast votes against his supposed ally and her main target, Scot. As the votes were tallied and Scot heard his name called out five times, he and Jason turned to Tai and waited for him to play his Idol. 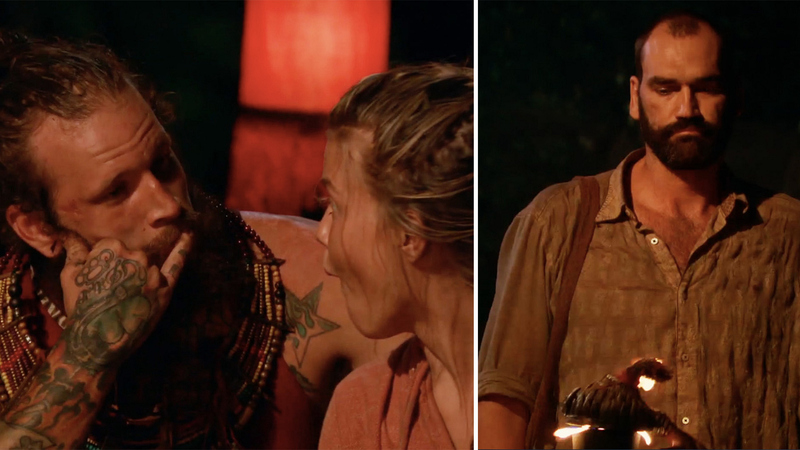 However, Tai just sat there, shook his head, apologized to Scot for not making the save—and just like that, Tai sealed Scot's fate with a Survivor sayonara. How will Jason survive without his partner in crime? And will Tai's bold move mean his true allegiance has shuffled over to Aubry? Jeff addressed the remaining seven, saying, "Well, once again, just when you think you’re safe—whoops!—here goes another blindside. Twelve days left should make for a very interesting finish." You can say that again. Watch this episode now and all-new episodes on Wednesdays at 8/7c.